Nothing ruins a good picture quite like chromatic aberration, which reveals itself as colour fringes. Letu2019s see what chromatic aberration looks like on technical targets and in real-world pictures. 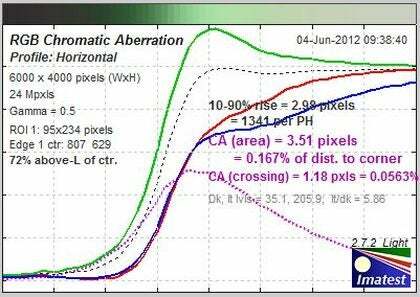 The theory of chromatic aberration is less important than how and where it shows up in photographs. That said, interested readers can look up the mechanism of optical dispersion, which is the unavoidable (but controllable) phenomenon that is responsible for chromatic aberration. In the early days of digital imaging, chromatic aberration was sometimes referred to as “the Italian flag problem”. This is useful because that term highlights an important fact, which is that (like the Italian flag) chromatic aberration is seen as a white area bounded by red and green stripes. In fact the red is often magenta (or purple) and the defect may therefore also be referred to as purple fringing – although sometimes the colours are completely different… blue and yellow! This is due to the fact that image processing takes place whenever a digital image is recorded and the rendered colours depend to some degree on how the data is interpreted by the camera’s electronics. As part of What Digital Camera’s testing regime, each lens is used to photograph a high-contrast target (shown above) across its aperture range and, in the case of zoom lenses, at a number of different focal-length settings. Given that the target features sharp boundaries between white and black areas it provides ideal conditions for exposing chromatic aberration. The two screen-grabs shown below are examples of serious chromatic aberration exhibited by a recently-tested lens. Severe though this chromatic aberration undoubtedly is, its presence does not render a lens useless. 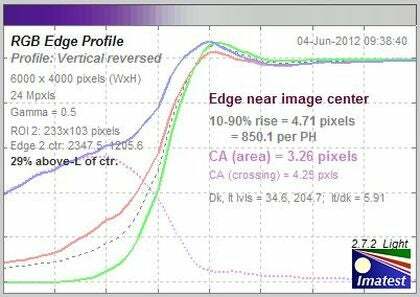 For one thing, test-target images are analysed at pixel level whereas scenic images are appreciated in their entirety and colour fringing may be so localised as to be visually insignificant. In addition, chromatic aberration is worst towards the edges and corners of pictures and if there are no critical features in those areas then the problem will go unrevealed. Portraits and scenes with sweeping skies, for example, are unlikely to reveal chromatic aberration. Architecture, on the other hand, is more likely to tax any lens that is prone to chromatic aberration. The problem can also show up in some unlikely areas… A few years ago a photographer friend of mine was commissioned to shoot a luxury book celebrating a cruise liner and some of the pictures were enlarged to create stunning gate-fold panoramic images. One of those images was of sports being played on deck and there was a white railing in the background that extended all the way from one side of the frame to the other: a short focal-length lens was used, coupled with bright sunlit conditions, resulting in the background railing being recorded fully sharp right across the picture. Towards the edges of the picture coloured fringes could be seen alongside the uprights of the railing, marring what was otherwise a lovely picture. I should add that the lens used was a high-quality optic from a professional camera system and the pictures were captured on 35mm transparencies, so this was not even a digital problem. Although a certain amount of chromatic aberration can be corrected using software tools that are in-built to some cameras and some image manipulation programs (such as Adobe Creative Suite) it is always best to avoid the problem at the outset. And it is for this reason that the existence (or not) of chromatic aberration is usually noted with WDC’s lens tests.